Are YOU Ready For Water Baptism? Do you have God's Holy Spirit? Do you realize your great NEED for it? Here's an article about YOU — and also to announce baptizing tours to be sent this summer from Ambassador College. THERE IS a real, literal, spirit Personality in heaven at the controls of this universe. He is GOD. If He is calling you to real understanding of His plan and purpose — and of His Word — you must act upon it! For God says: "My spirit shall not always strive with man, for that he also is flesh" (Gen. 6:3). When are YOU, personally, going to wake up to the surprising truths you have been given? When are you going to ACT on the vital knowledge you have been receiving through this magazine and The WORLD TOMORROW broadcast? You need to face the FACT that you, without realizing it, are very likely one of the multitude going the broad way that leads to DESTRUCTION! If you are following the crowd, if you have the same general attitude toward religion that most people do, then without doubt you have been DECEIVED! For remember that Satan the Devil "deceiveth the whole world" (Rev. 12:9). But many hundreds of you are coming to the realization that over The WORLD TOMORROW broadcast and through the pages of this magazine you are receiving the very MESSAGE that Jesus Christ brought to save this world from itself. If you are to come under the blessing and protection of the God and Father of Jesus Christ you need to be sure of that message — act on it, OBEY it. You need to PROVE to yourself once and for all that there is a personal, living, active, all-powerful, Creator God. You must know that the Bible is His inspired Word — His direct revelation to man of that essential knowledge of the real purpose of life and of the spiritual laws of life which, if obeyed, will bring happiness and success. You must prove and know that the Holy Scripture carries authority — that they are backed up by the power of the Living God who gives you every breath of air you breathe. You may already understand these things. But be sure that you have proven them to the extent that you would FEAR to disobey the commands of God in His Holy Word. It must be regarded as an authority over your very life. Christ said: "He that rejecteth me, and receiveth not my words, hath one that judgeth him: the word which I have spoken, the same shall judge him in the last day" (John 12:48). Once you have fully proved these basic principles to yourself, then you need to study and understand and obey the true MESSAGE of Almighty God contained in His Word. You must respect and fear the Living God enough to OBEY His commands. You have perhaps known of many people who made "resolutions" to live a better life; of drunks who decided to "give up the bottle;" of criminals who "reformed" by some means or other. If so, you will recall that most of these changes were neither permanent nor satisfactory. And even in those cases where a change in some area of life became permanent, the entire life, attitude, and actions were not totally yielded to the complete and perfect will of the Creator by any means. Human beings cut off from the true God can "reform" themselves to a limited extent. But they can NEVER effect that process we call "conversion." For true conversion is a TOTAL CHANGE which is effected by God in one's very mind and nature. After real conversion, you begin to study the Bible, meditate on God's law, and pray and, talk to God continually. By this process, and through His Spirit, you come to have the very thoughts and nature of God within you. Your whole LIFE is completely changed — converted, and you grow in grace and knowledge day by day. In spiritual attitude and character, you become more like Christ in EVERY phase of life. Such a total change takes place within you as would be impossible to bring about or account for except as a supernatural act of the Almighty God. But this supernatural help from God is available only on certain very important conditions. Jesus Christ and His apostles always preached the gospel of the kingdom or world-ruling government of God. In Mark 1:14-15, we read: "Now after that John was put into prison, Jesus came into Galilee, preaching the gospel of the kingdom of God, and saying... repent ye, and believe the gospel." Notice that the two things Jesus commanded were repentance and belief in His message. Jesus also taught that belief in the true gospel which He preached and obedience to the laws of God were inseparable. In Luke 16:16-18, He stated: "The law and the prophets were until John: since that time the kingdom of God is preached, and every man presseth into it. And it is easier for heaven and earth to pass, than for one tittle of tile law to fail." Here we see that the law and the prophets — the Old Testament scriptures — were the only revelation from God to man until John the Baptist's ministry. But now the spiritual message of salvation and the magnification of God's laws in their spiritual intent and purpose is revealed. But note that Jesus connected obedience to God's laws with the New Testament gospel of the kingdom. And, as if to squelch any doubt that He was referring to God's spiritual law revealed in the Ten Commandments, He continued by specifying the transgression of one of those very laws as that to which He was referring: "Whosoever putteth away his wife, and marrieth another, committeth adultery" (Vs. 18). Throughout the Acts of the Apostles, we find that the inspired servants of Christ continued to preach the gospel of the kingdom — including, of course, obedience to the laws of God. We see that Philip preached this gospel in Acts 8:12. Paul said he preached it to the gentiles at Ephesus in Acts 20:25. And in Acts 28:30-31, we find that he continued to preach this same message to the end of his ministry — even to the gentiles at Rome. This is the true gospel. It is a message of the government of Almighty God over our lives now as preparation for entrance into His soon coming world-ruling kingdom when Jesus Christ returns with Divine power and glory as King of kings and Lord of lords. And since God's kingdom has laws, it is a message of surrender and obedience to the laws and rule of God. You must first repent of your ways, you must turn from SIN which is the transgression of God's spiritual law contained in the Ten Commandments (I John 3:4), and believe the true gospel. Then there is another most important step you must take. That is water baptism. After total repentance and belief in the true gospel, water baptism is the next essential step you must take to be truly converted and to receive of God's Holy Spirit. In fact, it is a TEST of your real repentance and willingness to obey God. Jesus Christ commanded the apostles: "Go ye into all the world, and preach the gospel to every creature. He that believeth and is BAPTIZED shall be saved; but he that believeth not shall be damned" (Mark 16:15-16). Jesus meant EXACTLY what He said! In His parting commission as recorded by Matthew, Jesus said: "Go ye therefore, and teach all nations, BAPTIZING them into the name of the Father, and of the Son, and of the Holy Spirit" (Matt. 28:19). In Peter's inspired sermon on the day of Pentecost, he shouted: "Repent, and be BAPTIZED every one of you in the name of Jesus Christ for the remission of sins, and ye shall receive the gift of the Holy Spirit" (Acts 2:38). Notice that you are only promised the GIFT of the Holy Spirit on condition that you repent and are baptized. Later, Peter speaks of the Holy Spirit, "whom God hath given to them that OBEY Him" (Acts 5:32). You must DO what God says. You must repent and be baptized or you will NEVER receive of God's Holy Spirit. The Apostle Paul stated: "Now if any man have not the Spirit of Christ, he is none of his" (Rom. 8:9). In other words, unless you have fully repented of your sins, come to God through Jesus Christ as your personal Savior, and been baptized as He has commanded, you are NOT Christ's — you do not belong to Him. Therefore, you are NOT a Christian in God's eyes — never have been — and never will be UNLESS you are finally willing to surrender your life to God the Father, and accept Jesus Christ not only as your Savior, but as your High Priest, your coming King, your RULER — the One whom you will OBEY throughout all eternity! God's Spirit is the very nature and life of God through which we become His begotten sons. His Spirit will help us grow to maturity in Christian character. Its fruits are listed in Galatians 5:22-23. Notice them: "But the fruit of the Spirit is love, joy, peace, longsuffering, gentleness, goodness, faith, meekness, temperance" — or, as better translated, "self-control." The Holy Spirit gives us power for self-mastery, self-discipline, self-control. And through it, God's LOVE is shed abroad in our hearts (Rom. 5:5). The Holy Spirit makes us like God. You NEED God's Spirit. You NEED His guidance and protection. But the tremendous decision to yield yourself wholly to God — to live by His every Word — to OBEY Him throughout all eternity — such a decision must not be taken lightly. Baptism symbolizes the death and burial of the old, sinful self, and the rising from the watery grave to a new, a changed, a converted life. It also pictures the death and burial of Jesus Christ to pay for our sins, and His resurrection as the firstborn from the dead. The Apostle Paul writes: "Know ye not, that so many of us as were baptized into Jesus Christ were baptized into His death? Therefore we are BURIED with Him by baptism into death: that like as Christ was raised up from the dead by the glory of the Father, even so we also should walk in newness of life" (Rom. 6:3-4). The decision to be baptized hinges on your willingness to completely SURRENDER your will and your life to God through Christ as your Savior. He paid the penalty for your past sins, but when you know the truth you can no longer willfully do what you know is sin and expect God's forgiveness. God rules by His LAW! "Keep the commandments," said Jesus. "Know ye not, that to whom ye yield yourselves servants to obey, HIS SERVANTS YE ARE TO WHOM YE OBEY; whether of sin unto death, or of obedience unto righteousness?" (Rom. 6:16). When a choice has to be made between following the ways of your friends and family or obeying what you have found to be the will of God — which course do You follow? Do you take the easy way out and follow men? Do you serve and thereby WORSHIP the ways of men more than the ways of God? Don't "kid" yourself! You CAN'T fool God! 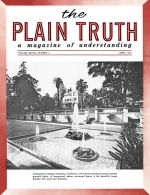 When you learn some new point of truth in the pages of this magazine, or on THE WORLD TOMORROW broadcast, or in your own personal Bible study, do you put it into PRACTICE in your life — do you OBEY it — or do you reject it because it conflicts with what your church or your particular society believes and observes? Are you like the Pharisees who rejected Christ because "they loved the praise of men more than the praise of God"? (John 12:43) God seems far away to some people, and their friends seem so close and so important. Which do you worship? Which do you OBEY? If you had to give up your job — your only source of income — in order to obey some point of truth you found in God's Word, would you do it? Would you exercise FAITH, as Jesus did, and rely on God's many promises to "supply all your need"? (Philip. 4:19). Would you worship God — or MAMMON? These questions apply to you! If you still have some questions about baptism, or if you are not certain as to the proper mode of water baptism, then read Mr. Armstrong's free booklet on "Baptism." This will explain any questions you may have on the subject. But the decision to be baptized is yours. If you feel that you are ready to make an unconditional surrender to God through His Son Jesus Christ as personal Savior, then write an airmail letter to Mr. Armstrong telling us that you want to be baptized this summer. Each summer we send out teams of ministers and advanced ministerial students to council with and baptize those who are ready to fulfill this command of God. These men will be leaving soon after college commencement. So don't delay! Get your letter in the mail immediately telling us you want to be on the baptizing list for this summer. Our men will then contact you and arrange to meet you at your own home or in a nearby town or city. And those of you in Britain and Europe who wish baptism should write to our London address. Australians and New Zealanders should write to our North Sydney address. The understanding of God's Truth is — in a sense — dangerous knowledge. For this knowledge carries with it great responsibility. May God grant you the honesty and courage to ACT on what you know!